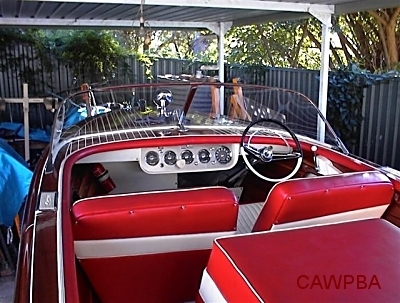 Caroline is a 1960 18' Chris-Craft Utility runabout. The boat was purchased in the late 1990's in Ventura, California, from the estate of famous Hollywood film producer and aviator Howard Hughes. 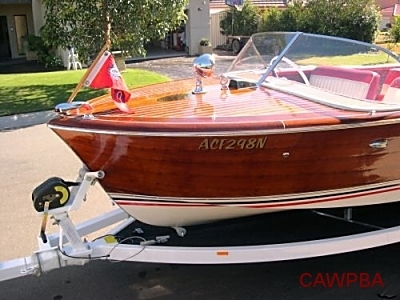 In storage for at least 20 years along with the contents of his many mansions, this 18 foot Chris-Craft, of which only 490 were built, was shipped to Los Angeles, where some of its restoration work was started. It was then imported into Sydney. 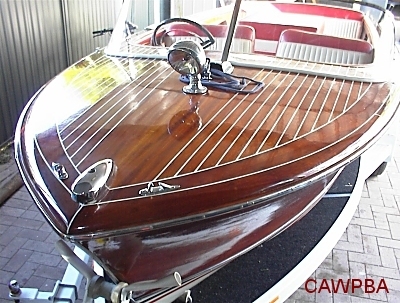 The boat then underwent a three year major restoration. This was done by Michael Bartlett of "Busted Vessels" at Careening Cove. Caroline is built of red mahogany on white oak frames and was hand sanded before receiving 12 coats of lustrous varnish. Fasteners and plugs were renewed. Below the waterline is finished in three coats of dynel to give the already strong, double planked mahogany hull more strength and to cut down on maintenance. The inside of the hull below the waterline is finished in white 2 pack epoxy. The rudder is manganese bronze and the prop shaft is bronze - turned, ground and polished. There is an original "Ivanlight" searchlight on the foredeck. Flags have been recreated as per original. having UV protection. 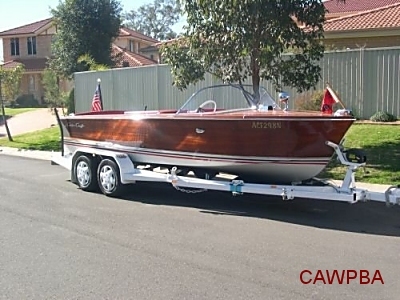 This magnificent boat sits on a new custom built "Easytow" trailer (the original trailer was not declared when imported and had to be destroyed) complete with extendable draw-bar for easy retrieval at low tide. The tops of the guards are finished with polished stainless steel inserts. 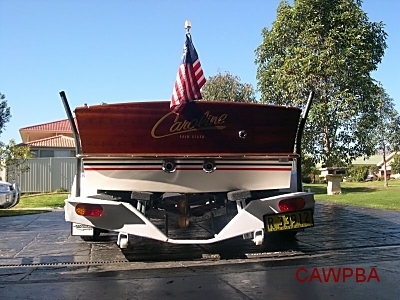 The engine is a 283 ci Chev Corvette V8 and has been totally reconditioned, including the original Carter WCFB carby, distributor, fuel pump, generator etc. 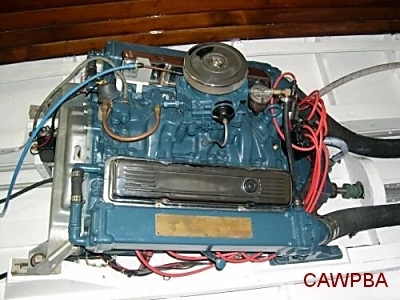 While the engine appears original, "new world" heads and valves have been fitted, thus producing substantially more power and enabling the use of unleaded fuel. "Shoosh Valves" have been added to new exhaust hoses in an attempt to quieten the motor. 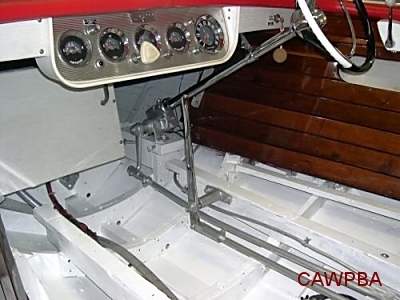 The gearbox is mechanical with forward, neutral and reverse The prop and skeg have been balanced to minimize vibration. Other new extras are auto bilge pump, manual bilge pump and electrical cut-out switch and bilge blower. The boat has been authenticated by the Maritime Museum in the USA.